It’s hard to believe that filming is coming to a close on the pilot episode of Shadowhunters. On day 11 of filming, executive producer/director McG and show runner Ed Decter spoiled fans with a ton of photos from the set. Shadowhunters will begin filming episode 1×02 soon. According to Maxim Roy, it shouldn’t be long now. Really liking these photos so far ! Lots of photos 🙂 Thank you for sharing them! And it’s awesome that Maxim was cheering on the Blackhawks though they lost this game 3-2 at last minute </3 Oh well! These look really great! Am I seeing right? Matthew is wearing blue contacts? Can we finally say hallelujah that our Alec is going to have blue eyes like he’s supposed to? Matt’s eyes look very blue! Is it the filter or does he have blue contacts? The institute photos are stunning! So beautiful!! So it’s totally sleek and modern hidden inside the church-like building, alright, cool! GUYS GUYS, BLUE EYES. Unless it’s just the filter/ lighting ….MATT’S HAS BLUE EYES AS ALEC. FREAKING OUT. Emeraude’s costume’s looking scorchingly hot. How is the walking yet alone fighting in those shoes! Pure Issy skills. Steles look exactly like the film ones….. Cool to see runes in various stages of fading. There was another bts photo with someone in prosthetics and makeup, and it looked so much like a Forsaken to me….. anyone seen it and agree?? Thank the producers so much for letting see all these!! I agree about the runes. I love the detail they have as far as the various different stages of the runes fading and looking more scar like. BY THE ANGEL I AM SO DAMN EXCITED!!!! THIS BETTER AIR IN AUSTRALIA OR I AM GOING TO CRY!!!!!!! EVERYONE LOOKS SO AMAZING! MATT HAS BLUE EYES GUYS, I REPEAT MATT HAS BLUE EYES!!!! BY THE ANGEL!!!! THE RUNE LOOK AMAZING! I SPY IZZY’S BRACELET AND THOSE SHOES ARE SO KILLER! I DON’T KNOW HOW EM IS SHADOWHUNTING IN THEM! Reblogged this on Mindful Diversities. As much as I’d like Alec to have blue eyes I’m not 100% sure that’s going to happen. It might just be the filter or the lighting of the picture because I’ve seen pictures of Matthew where I think his eyes look more brown and some where they look green/hazel. We’ll just have to see and be happy either way I think. I wish they would confirm for us! Clave is looking Beautiful, so are clary’s drawings! The runes are great and I love izzy’s whip- light wood sibling love is too adorable! And clary with Jocelyn is priceless! 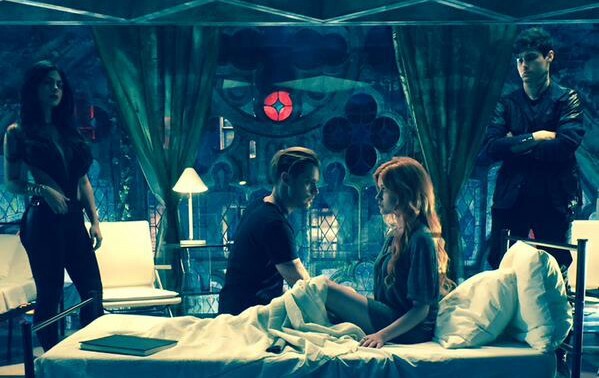 Clary’s hair is gorgeous, so is all of izzy, I have high hopes for males and the color scheme is perfect. This entire post makes me so happy and so exited for the show! Please please please tell me this will be showing in Australia when it comes out.